I’m going to a Luau this weekend. I’ve been asked to bring Hawaiian Macaroni Salad. Say, what? . . . . I had never heard of this before. But indeed Hawaiians like to serve macaroni salad as a side with sticky rice along with their pork. And don’t even think about cooking it al dente. The whole premise behind the dish is to cook the macaroni to death (they call it fat macaroni). This allows the seemingly large quantity of mayonnaise and milk to absorb into the pasta making it creamy. 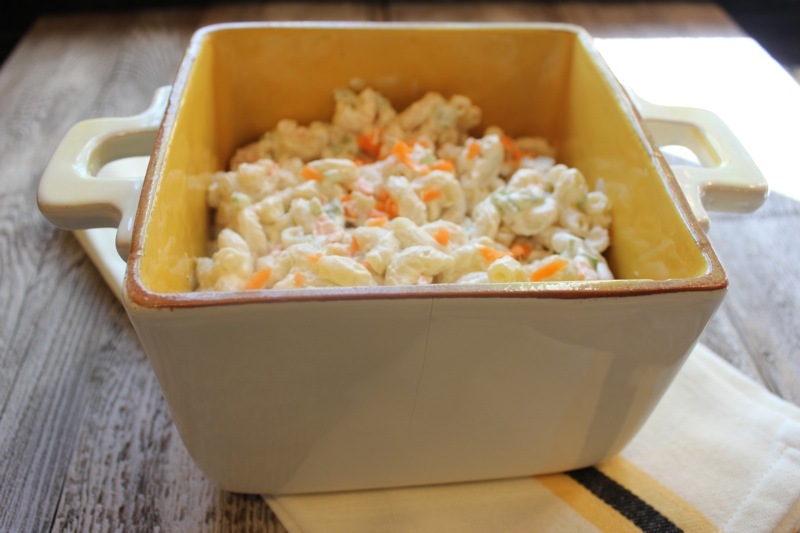 It is a very simple recipe with few ingredients; just macaroni, mayonnaise (it has to be Best Buy or Hellman’s), milk, brown sugar, cider vinegar, shredded carrots, celery and scallions. But the simple ingredients unite to make a creamy, slightly sweet and sour salad with the crunch of carrots and celery. Deceptively easy and good. It is perfect with pork. The luau is being held at fellow blogger Larry’s Almost Heaven South dockside pavilion where several bloggers have joined forces to roast a pig. At least that was the last word I had. It may be just parts of the pig for all I know. But I do know that we bloggers and spouses will have a grand time. Here are scenes from last year’s event. Have a wonderful Memorial Day weekend. This salad would be a great side for anything you cook on the grill. Whisk 1 1/2 cups milk, 1 cup mayonnaise, sugar, 1/2 teaspoon salt and 2 teaspoons pepper in bowl. Bring 4 quarts water to boil in large pot. Add 1 tablespoon salt and pasta and cook until very soft, about 15 minutes. Drain pasta and return to pot. Add vinegar and toss until absorbed. This prevents the vinegar from curdling the milk. Transfer to bowl. Cool pasta 10 minutes, then stir in dressing until pasta is well coated. Cool completely. Add Scallions, carrot, celery, remaining milk, and remaining mayonnaise to bowl with pasta mixture and stir to combine. Season with salt and pepper. Transfer to serving bowl and refrigerate, covered, for at least 1 hour or up ro 2 days. Serve. Enjoy the luau. I am sure there will be photos to share with the rest of us. You go girl – can wait to try it – I’m still experimenting with a few things. See you Sunday – you chariot awaits. Can’t wait to try your salad Penny. I’ve never heard of Hawaiian macaroni salad either. You did a great job. See you tomorrow. This Sounds yummy. Have fun at your Luau. Looking forward to seeing you next weekend! I had never heard of a Hawaiian mac salad before either! It looks yummy. Have a great time at the Luau! Have a fantastic time at Larry’s!! Since I can’t be at the Luau, I might have to make this so I don’t feel so sorry for myself. Have a great time at the Party Penny. You bloggers are indeed going to have a grand time at Larry’s! Enjoy. I am hoping one day to attend too. 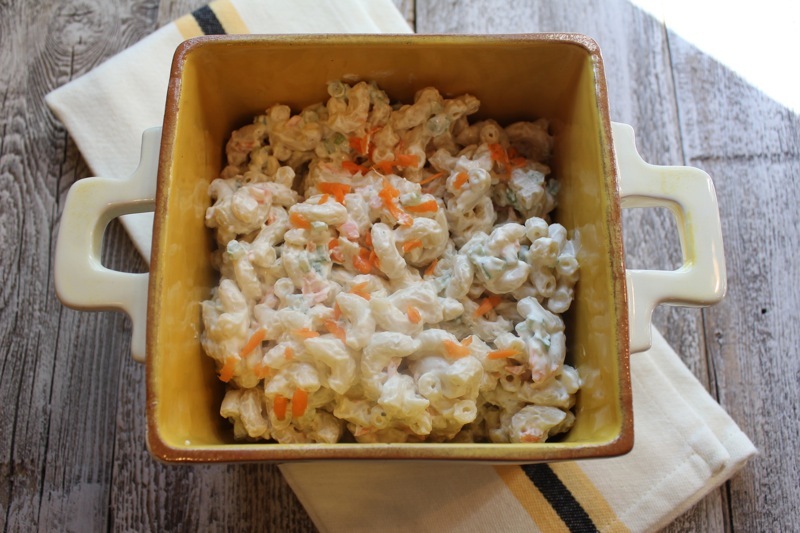 The macaroni salad looks good. Everyone will enjoy it. I enjoyed it very much! Like you, I had no idea it was a “thing” in Hawaii either until we started looking into this. I thought it was a Southern thing growing up because we had it at church pot lucks all the time. Going to a big luau tomorrow and going to make this!! This post was published by Penny on May 24, 2013.